You should read this book under the covers. There are some mature scenes, and I would not recommend reading this in front of you mother. Just don’t do it. This is a sad book. But you’re going to be too hooked on it to care. I love Pattyn. She’s amazing. She’s been raised to act a certain way, and she finally realizes that’s not the right way to live. I love how she has the courage to stand up against her crazy father. This girl is so strong, and I want to be as amazing as her. Ethan is perfect. He is so sweet and kind. He knows Pattyn has been abused and he helps her. He never pressures her into anything. Plus he saves her life!! Pattyn’s father is very crusty. There is another extremely crusty part, but it’s a spoiler, sorry. I think the cover is good. It’s simple. 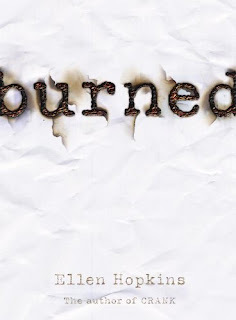 All Ellen Hopkins’ book covers basically describe her books. It’s just perfect. The first song that reminds me of Burned is Let The Flames Begin by Paramore. Pattyn is basically saying, hate me, I don’t care. And that’s what the song says. The second song is Chasing Cars by Snow Patrol. I could see Pattyn and Ethan just laying under the stars listening to this song. Future Companion Novels: Ellen Hopkins just announced a sequel to Burned called Smoke. I am extremely excited for it. Overall Rating: I give this book a 4. It is so good, but when you get to the crusty part, you just want to throw the book down, and run away screaming. But it’s still an amazing book, and everyone should read it.